Travelling to Japan with your ExpressCard-equipped notebook? Then you may care to sample the delights of the nation's bizarre - by Western standards - telly programming with local supplier Sanwa's new ExpressCard 34 digital TV tuners. Sanwa today launched two cards, one for Windows machine, the other for Macs - respectively, the VGA-TV1S2 and the VGA-TV1S2M. The Windows version is green, the Mac model red. Both models incorporate EPG (Electronic Programme Guide) software, but while the Windows version also comes with a DVR application, Mac users are denied this. 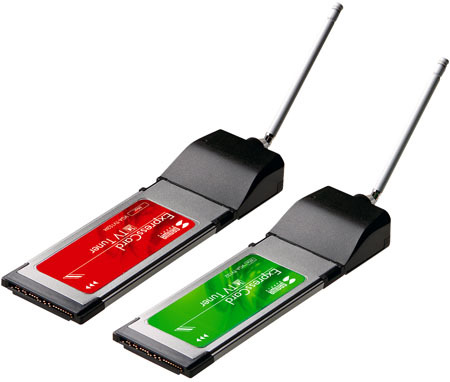 The card comes with three types of micro-antenna, and there's an adaptor to allow you to connect the card to the F-type output from a roof-mounted aerial. The real snag: the card's tuned to Japan's ISDB-T terrestrial digital TV standard, so it's of limited use outside the nation. Well, apart from Brazil, which has adopted ISDB-T as the basis for its digital TV transmissions. Sanwa didn't set a price for the cards, but local media estimate the Windows and Mac products will retail for, respectively, ¥10,800 ($89/£45/€66) and ¥11,800 ($96/£49/€73). Can it really make money when Sony et al can't?